What’s my favorite part about living in Southern California? It’s not the perfect weather or the ability to get from the beaches off the Pacific Coast Highway to the snowy mountains of Mammoth in a matter of hours. It’s the fact that I can drive to at least five different breweries all within ten minutes, give or take, and enjoy a glass of beer paired with food from a food truck right outside the brewery. Or now my newfound favorite, watching Game of Thrones while enjoying a delicious pint and meal at a brewery! I did not know such greatness could exist, until I lived it. The growth of the craft beer industry cannot be ignored. We have breweries popping up left and right, kind of like we’ve seen with the coffee industry. While the coffee shops promote more of a solitary atmosphere, what’s great about breweries is the sense of community being brought back to life. We evolved into a more disconnected society and breweries have been bringing people together. Breweries have become a watering hole for many to gather and try out brews each place has to offer. The Bruery Provisions, now Provisions Market, in Old Towne Orange was once my go-to place and Bootlegger’s Brewery in downtown Fullerton has been a staple, but the newly opened Bottle Logic Brewing in Anaheim has now won me over and I have a whole new world of beers to explore. My favorite beer at Bootlegger’s is their Knuckle Sandwich Double IPA, which is a limited release beer, so I usually stray away when it’s not on tap (now). 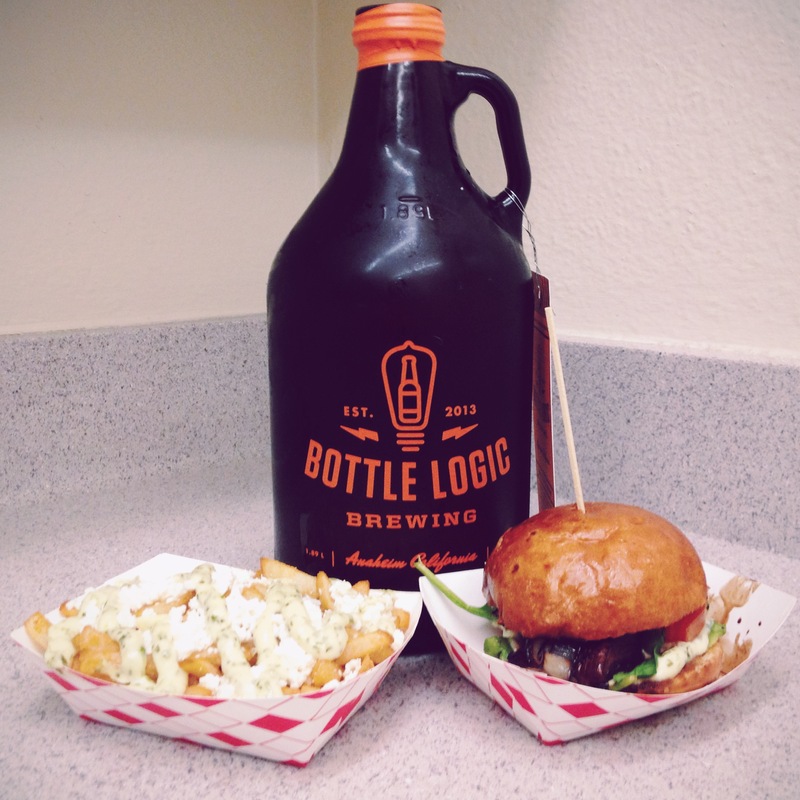 Bottle Logic Brewing, however, has their limited release Double IPA, Double Actuator, on tap right now! I’d like to taste it next to the Knuckle Sandwich, so I can decide which I like better. Now when I’m drinking a beer, I get hungry. Now how perfect is it to have a food truck outside prepared to serve you their specialty; you’ve got The Viking Truck with their Loki and Dragon Eggs to Burger Monster and their Attack of the Killer Potato or GarlicScape and their Garlic Feta Fries. Unfortunately, I have yet to experience Kogi BBQ at a brewery. You don’t need to drive anywhere and decide where to eat, let alone drive drunk, you just conveniently walk outside. Someone told me that food trucks aren’t as big as they used to be in Southern California, but with the birth of many breweries, it’s a match made in heaven and might even create more food trucks. 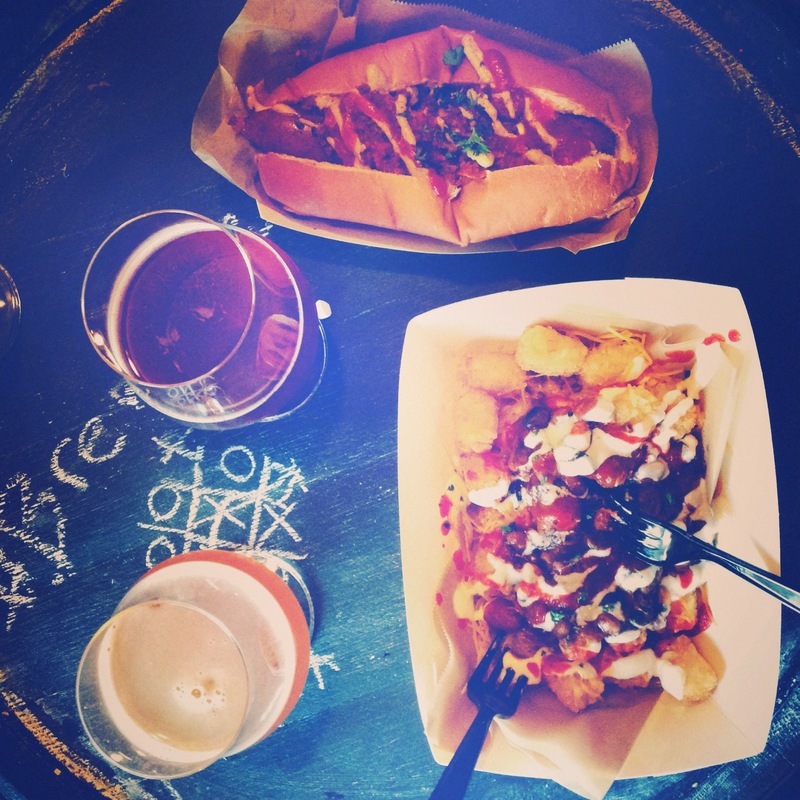 Want to enjoy beer and food from the comfort of your own home? Then grab a growler and get food to-go! One day I was bummed that all the food trucks I was craving were not anywhere near me and I thought to myself, why can’t I just go to a place that doesn’t move? Then I realized there’s some sort of thrill of scrolling through my Twitter (which I solely created for this purpose) feed and googling trucks, trying to figure out what food trucks are where and if I want to drive to them. Usually the jackpot is when my favorite food truck is at a brewery. My biggest jackpot thus far has been Bottle Logic Brewing playing season three of Game of Thrones that led into the season premier of season four + the Double Actuator and their special medieval cask for the night ‘Hodor,’ which taste like horchata, + The Viking Truck right outside! The say good food brings people together? Now add good beer to it! I think now is the best time to live in Southern California if you can appreciate a good bite and a good pint. Eat local and drink local. I even hear the mayor of Anaheim plans to make the city the hub for craft beer in Orange County. Craft beer is on the rise everywhere and has become more artful in many ways. Now do yourself a favor and get to your local brewery and grab a pint and a bite at a food truck!